Before we got married, the sommelier and I would go out to eat at least once a week. Back then, it consisted of Soleil Bistro & Wine Bar, Fredericks, Bistro Vatel, or L’Etoile. We ordered escargot, mussels and fries, steak diane, and my favorite, liver and onions. Times have changed, however, and even though I still crave French foods from time to time, our palates have become more refined, cleaner, and the traditional food of the past have frankly, well, become the past. It was even more evident this last Monday, as we dined at Chef Jason Dady’s Bin555 for my latest birthday celebration. It had been quite some time since the sommelier and I had a date alone, as Rhea has been accompanying us on our latest dinner escapades with friends. The restaurant itself was extremely busy for a Monday, as the only seats in the house were found at the cork covered bar. It took no time for the sommelier to find wines that were of good value, as Bin555 has always been known to carry reasonably tasty vintages. The sommelier started us off right with a Toscano Sangiovese, from a small family winery in the Montecucco DOC, just south of Montalcino. The 2008 Perazzeta Sara Rosso was bright, lightly acidic, yet had undertones of earthiness. It paired perfectly with our first course, a pork belly spring roll with tea dipping sauce. The roll was crisp and light, the sauce a slight feel of vinegar. The dish set the tone for the evening, small comfort bites revealed in a fresh air. 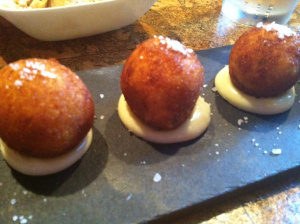 We moved on to the crab croquettes, listed as a traditional plate on the menu. I could not have been more pleased with our selection. The blue crab was cooked perfectly, blended with mascarpone, and gently breaded and fried. The resulting croquette was then laid in lemon aioli. My eyes could only imagine the flavor, as the crab and cheese literally melted in my mouth. The lemon provided an extra layer of gentle acidity that brought out the crab’s flavor. My thoughts turned to the coast, and I could imagine the cool breeze and salty waters. I touched the sommelier’s hand. This would be an excellent night of fare. At this point, I knew that our plates would all be excellent, one after another. I was not disappointed in my judgment. 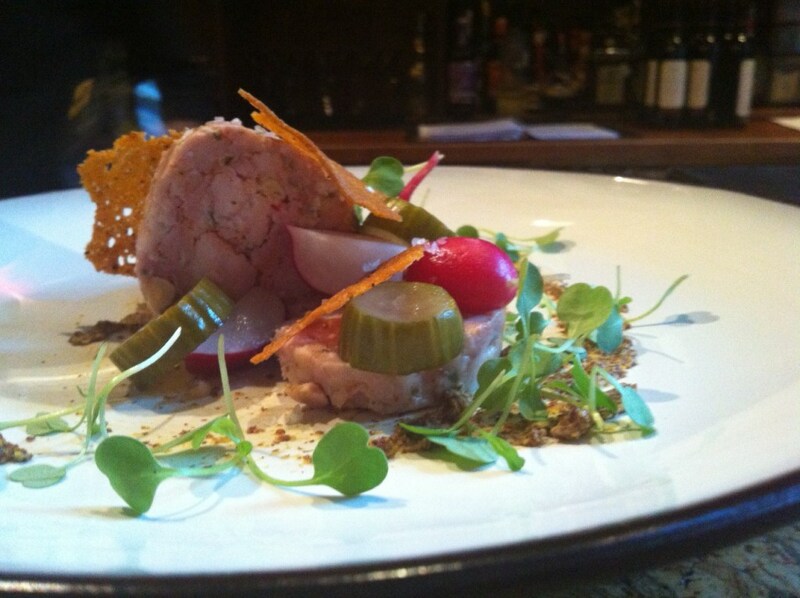 The rabbit charcuterie arrived next, complete with pickles, radishes, and micro greens laid in stone ground mustard. Presented beautifully, I felt as if we should be sitting in New York, LA, or Chicago. Did San Antonians know how flawless the marbling was in this dish? How the rabbit and micro greens blended perfectly with the mustard? Even the pickles and radishes were clean and fresh, local, and contributed to the essence of the dish. Needless to say, I was already thankful for our choosing. I could also tell the sommelier was enjoying his night, as he scooted his barstool closer to mine, and ordered a Pessac-Leognan Bordeaux. The Korean BBQ tacos were delivered by wait staff dressed properly for the feel of the restaurant, inclusive in jeans and long sleeve black dress shirt. In a relaxed atmosphere, the notorious street dish well known in Austin, LA, or Portland, was executed spotlessly. 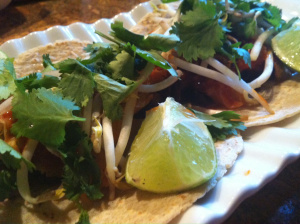 The BBQ was made with kimchee sauce, and topped with sprouts, cilantro, and a squeeze of lime. The sommelier and I devoured them as if we had just come out of Emo’s in Austin, spending the evening listening to some indie band unknown to the general populace. I could taste the street smokiness in the back of my mouth, and could envision the night sky lit by the architecture of the Frost Building. I found myself awakening to a glass of supple red wine swirling on the cork bar. The sommelier knows that my favorite region of France is Bordeaux, with flavors of black currant, soft tannins, and sweet tobacco. The 2009 Chateau Picque Calliou did not disappoint, and while we may not have normally paired this particular wine with the spicy flavors of kimchee, I was elated to find this particular highly rated vintage for such a fabulous price. 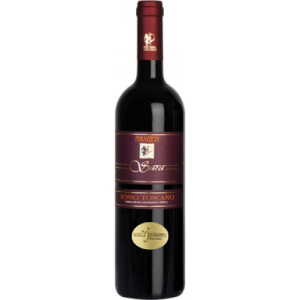 I sipped the nectar gradually, breathing in the smoothness of the fruit, and enjoying the sleek finish. Our last small plate is well known to those who have had the pleasure of visiting the Duk Truck, as Chef Dady has been bringing filled steamed buns to our own streets for quite some time. 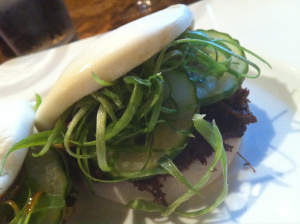 The duck is prepared in traditional confit style, pulled, and then arranged on a mantou bun with cucumbers. The result? Chinese steamed buns are a new favorite of mine; doughy, plain, and light, the bun itself does not take away the flavor of the duck, and allows the cucumber to penetrate the comprehension of the dish. I could immediately see why this distinctive snack has been so popular. Delish! 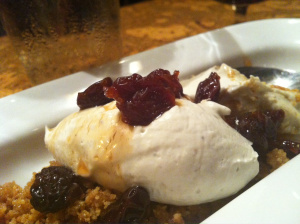 We rounded out our meal with cheers involving tawny port, and the distribution of a highly favored dessert: a deconstructed cheesecake with sour cherries. As far as birthdays go, I will have to say this year I spent it exactly as imagined. With the presence of my sommelier, an escape from the everyday, and plates and plates of gorgeous food, I relished every moment.